Shop for winter storage crops directly from LOCAL farmers IN BULK to fill your pantry for the winter. Load up on local root veggies, greens, cabbage, squash, apples, tomatoes, peppers, meats, fish, preserves and pickles. Last market of the season! Volunteers needed to help with set up and clean up. Garlic, winter squash, tomatillos, kale, bulk tomatoes, pole beans, black beans, and apples. Olde country sheep with pasture perfect lamb, including sausages. Eggs, squash, cascade berry vinaigrette. Preserves, dried fruit, and fresh fruit and vegetables. Fresh frozen Sockeye fillets; cold-smoked Albacore Tuna loins; Smoked Sockeye half-fillets; pre-sliced goldboard cold-smoked sockeye; thick-sliced ‘pounder’ smoked salmon bellies. Squash, potatoes, storage onions, hot peppers, broccoli, kale, apples, garlic and chard. Whole frozen chicken, beef, winter squash, garlic, and sweet onions. BECKY’S HOT FOOD available while you shop. Spicy Jamaican patties (beef and veg.) samosas (beef, chicken, veg., and spinach), chicken wraps (with coconut milk base and spices), homemade Jamaican ginger beer, and ginger cookies. These products are available at wholesale, on order. Another fruitful season of the Gleaning Project is drawing to a close. Every year I’m amazed at the generosity of this island, and the incredible bounty that we share. I feel so lucky to have this job since picking fruit outside with friends and neighbours is one of my all-time favourite activities. There really is nothing more beautiful than the sunlight coming through the leaves of an apple tree, and there is a special kind of zen to picking ripe fruit. And always the promise that the next one will be the biggest or the most perfect or the sweetest. 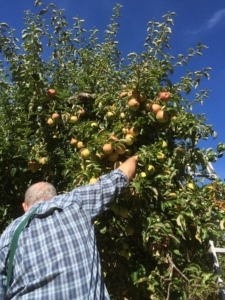 This year so far, the Gleaning Project has brought 65 volunteers together to pick over 8,500 lbs of produce, including assorted varieties of plums, figs, hazelnuts, crabapples, apples, pears, quinces, corn and kale. 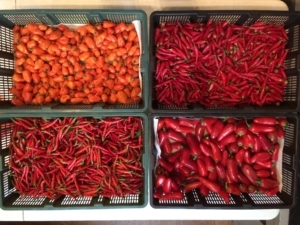 The volunteers who come out find all kinds of creative ways to use the harvest for their families: drying, pickling, canning, and of course just fresh eating. 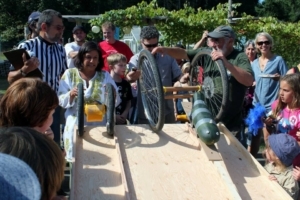 This year, one picker is using an upcycled washing machine to make cider! The Food Program’s share was distributed to families in need, as well as used for workshops and community kitchens and events. This year it seems the word about this project really got around, as we had double the number of landowners and farmers who reached out and invited us to come pick. We are very grateful for their generosity – without it there would be no Gleaning Project. Thank you everyone, and see you next year! Teams will consist of 4 to 8 people. Form your teams ahead of time – or pick up tug-of-war on Sunday. Come join your neighbours, bring a friend, meet someone new. Share a favourite dish, stories, games and live music. Last year was a blast! Celebrate the end of a great summer. Everyone, young and old, is welcome. Pie-baking contest! Zucchini Races! Soccer game! New this year: Tug-o-war at 12:30!